Mission Statement | Alamo Scouts Historical Foundation, Inc.
During World War II a small group of specially chosen, specially trained men infiltrated Japanese occupied islands in the Southwest Pacific Theatre to prepare for the return of allied forces. This group of men were the 132 members of the little known unit called the Alamo Scouts. It is our goal to bring to light the efforts of these men, the acts of heroism, the sacrifices, and the comradeship they shared. Welcome to a website dedicated to the 138 men who were the Alamo Scouts. During WWII it was the Alamo Scouts who entered the Japanese occupied islands in the South Pacific and conducted 107 covert operations without losing a single man. Each team was made up of 6 to 7 men who risked their lives against seemingly unbeatable odds. Their combined operations totaled 1482 days behind enemy lines. The brutality of the enemy was never so clear as seen by these 138 heroes. It was their efforts in the South Pacific that prepared the way for the final victory over the tyranny of the Japanese. The Alamo Scouts Association, headed up by Col. Robert Sumner (Ret. ), is dedicated to preserving history for future generations. 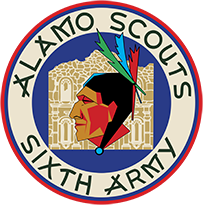 I am personally interested in this project because my father, who passed away in 1997, was an Alamo Scout. I remember the stories he would tell about some of his missions. I remember looking through his military foot locker and actually playing with his ribbons, patches and war mementos (the shoulder patches I understand are now worth more than $2,500.00). Although my father would tell me about the war, he was always reticent about telling details. Even when I pressed him for more information he would only tell me so much. Sgt. William Blaise, was a man who did his duty and probably never considered himself a hero although he was awarded 2 Silver Stars and a Bronze Star. I was compelled to remember them all. For that is what the Alamo Scouts were about, one for another. I am particularly grateful for the work of Lance Zedric. In his book Silent Warriors of World War II he captured the story of the Alamo Scouts and for the assistance of Col. Robert Sumner (Ret. ).